As Oman’s position as a transit port for arms and slaves went into decline in the mid-19th century, much of its former prosperity was lost, and the economy turned almost exclusively to agriculture, camel and goat herding, fishing, and traditional handicrafts. Today, however, oil and gas fuel the economy, and revenues from petroleum products have enabled Oman to witness a remarkable development over the past four decades. Realising that Oman is highly dependent on the hydrocarbon sector, and oil and gas will run out in the future, the Omani government in recent years has been focusing on the development of industry, trade and tourism. The Sultanate of Oman saw decelerating economic growth in 2016, as a result of lower investment in the oil sector and generally lower public spending. Despite fiscal consolidation efforts to reduce the deficit, this remains high, in part due to low oil prices. Consequently, Oman continues to resort to its reserves and to borrowing. The predicted increase in oil prices and the expansion of the non-oil economy will improve the macroeconomic outlook. Gross domestic product (GDP) in 2015 was $69.83 billion, compared with $81.03 billion in 2014 and $78.93 billion in 2013. According to the International Monetary Fund (IMF), GDP per capita in 2015 was $16,699. GDP growth in 2017 is expected to be 2.6 per cent, compared with 1.6 per cent in 2016. Inflation in 2017 is expected to be 3.1 per cent, compared with 1.1 per cent in 2016 and 0.1 per cent in 2015. The World Bank highlights the necessity for gradual and continuous reform to preserve Oman’s financial and external sustainability. In addition, the government’s ability to monitor the emerging risks that may impact its financial sector needs to be enhanced. Oman may need to rely on policies that reduce the impact of falling oil revenues on the population. Among the main risks facing the economy are oil price shocks and a potential increase in interest rates. The implementation of the economic diversification policy is being prioritized in order to bolster growth and secure work opportunities. Oman ranked 66th in the Global Competitiveness Report 2016-2017, dropping four places from 2015-2016. In 2013, hydrocarbon revenues in Oman were 31 billion USD. They accounted for 66 percent of Oman’s exports and 39 percent of its gross domestic product (GDP), according to the Central Bank of Oman. Oman has been more open about its oil and gas reserves than some of its neighbours. This perhaps results partly from the fact that the country is not a member of the Organization of Petroleum Exporting Countries (OPEC) and therefore not concerned about OPEC quotas. An additional factor is the presence of foreign companies that book reserves in Oman, rather than operating solely as service companies. 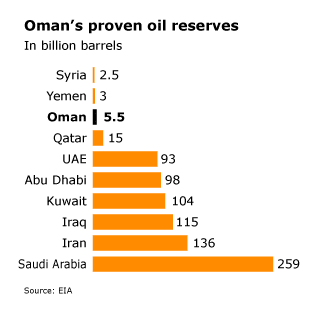 Moreover, contrary to neighbouring countries, Oman’s oil reserves are often deep and tight, leading to more expensive onshore extraction costs (as much as four times that of Saudi Arabia), and, in recent years, extensive use of enhanced oil recovery (EOR). According to the U.S. Energy Information Administration, Oman’s proven oil reserves are about 5.5 billion barrels. This is smaller than all other Persian Gulf countries except for Bahrain, though larger than Oman’s neighbour Yemen. Oman possesses offshore fields as well as onshore fields, and the development of offshore fields has, along with onshore EOR, helped to maintain reserve levels for the Sultanate. However, production levels of crude oil and condensate fell during this decade after peaking in 2001 at 960,000 barrels per day (bbl/d). 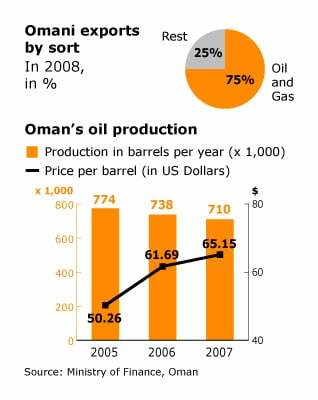 Natural production declines from aging fields combined with the difficulties of increasing reserves given Oman’s geology resulted in a steady decline to 710,000 bbl/d by 2007. From 2008 onwards, however, new investment and implementation of EOR bore fruit, with average production reaching 919,000 bbl/d in 2012. One of the most important contributions to the return to production growth is the Oxy led steam flood project at the 2.1-billion barrel Mukhaizna heavy oil field. 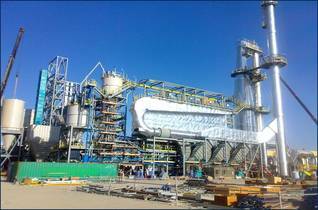 The company has increased production on the field from 5,000 bbl/d when it started the project in 2005 to 120,000 bbl/d in 2012. Other projects contributing to the renewed growth, though smaller in scale, include the Rak Petroleum (a private Omani company) and LG (of South Korea) offshore Block 8 that is building up production to 10,000 bbl/d. Most of Oman’s petroleum production acreage (about 85 percent) is controlled by Petroleum Development Oman (PDO), which is owned by the government of Oman (60 percent share), and the private companies Royal Dutch Shell (34 percent), Total (4 percent), and Partex (2 percent). PDO has a forty year concession/operating agreement, which began in 2004. In 2008, PDO invested 170 million USD in exploration and appraisals. Other important projects expected to come online soon include the Karim cluster of oil fields being developed by Medco Energi of Indonesia, which is trying to increase output from around 12,000 bbl/d to 30,000 bbl/d. 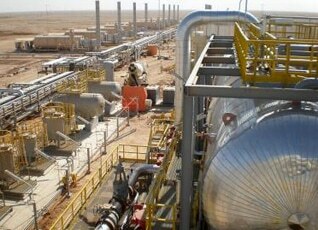 Another is the Rima Cluster of Oman’s Petrogas, which is attempting to boost production from 2,000 bbl/d to 7,000 bbl/d. 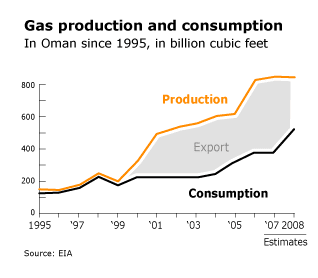 Oman’s gas production increased from 99 billion cubic feet in 1990 to 936 billion cubic feet in 2011 (Source: EIA). Nearly all of the Sultanate’s gas is produced by Petroleum Development Oman (PDO). Oman’s domestic natural gas pipeline system is controlled by the Oman Gas Company (OGC), although OGC has contracted the management of the network to a consortium of private companies. Oman’s natural gas network spans about 1,100 miles, bringing supplies from production centres to the country’s LNG terminals, power plants, and other domestic end users. Oman has put large efforts into developing its natural gas reserves, despite its reserves being relatively small for the region. Proven natural gas reserves are estimated by the EIA at 30 trillion cubic feet. This is the least in the Persian Gulf, other than Bahrain, though still a sizable amount by global standards. For example, it is greater than the gas reserves of the United Kingdom. However, like the United Kingdom, Oman has very high demand for its domestic gas (in 2011, consumption amounted to 619 billion cubic feet). Although this does indicate a high level of economic development in the Sultanate, it also means that Oman, like the United Kingdom, will import more and more gas, despite being a sizable producer. As with oil, PDO is investing to expand natural gas production, but a number of non-PDO exploration and production projects are also being carried out. 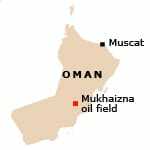 Most important is the Mukhaizna field, which is estimated to contain as much as 934 bcm, though this would concern gas in place, not proven reserves. In April 2009, Petronas signed a deal to explore Block 63, Harvest a deal to explore Block 64, and BG a deal to explore Block 60, all for gas. Oman’s infrastructure, especially its road network, has expanded greatly in recent decades. 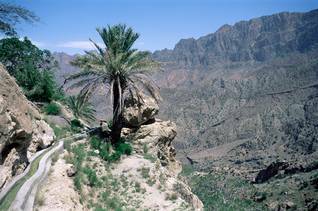 In 1970, before the accession of Sultan Qaboos to the throne, Oman had only ten kilometres of roads. According to Oman’s Ministry of Transport and Communication, Oman now has 12,402 kilometres of paved roads and 17,009 kilometres of graded roads. There are six main ports in Oman—Matrah, Salalah, Qurum, Sur, Sohar, and Duqm—and several smaller fishing harbours. The ports of Sohar (partially owned by the Port of Rotterdam, the Netherlands) and Duqm have been assigned particular importance to Oman’s industry and trade. The old port of Matrah, traditionally a fishing and trading port, will be developed to serve tourism and leisure travel. Despite the significant growth in the last forty years, Oman lags behind its Gulf Cooperation Council (GCC) neighbours in infrastructure, according to Middle East Economic Digest (MEED). Infrastructure that has been built since 1970, particularly in the capital area (Muscat), is struggling to cope with the high rate of growth in mobility. Cities, towns, ports, and airports are far apart, and the current network of roads does not adequately serve Oman’s industry and trade and its tourism potential. It is this potential that needs to be realized, in order to boost the national economy. Protests by Omani nationals in recent years, demanding more jobs, have shown that the country needs economic diversification to create more employment opportunities. Moreover, Oman has just 17 years of oil production left (at current extraction rates) and hence is under more pressure than other GCC states to invest in non-oil sectors. To support this diversification, expansion of the current transport network is needed. Realizing this need, Oman is investing heavily in upgrading the road network, developing a national railway system, and expanding airports and seaports to serve the growing tourism sector and the development of industry and trade. Ahmad bin Hassan al-Dheeb, undersecretary of the Ministry of Commerce and Industry, told MEED last year that the sultanate would spend about 20 billion USD on transport projects in the coming years. A new national railway, connecting the UAE border with the Port of Sohar, Muscat, the new port of Duqm, and the southern city of Salalah, will be part of a wider railway network in the GCC. That network, which is planned to extend from the Iraqi border in Kuwait to Muscat, has been in development since 2008. 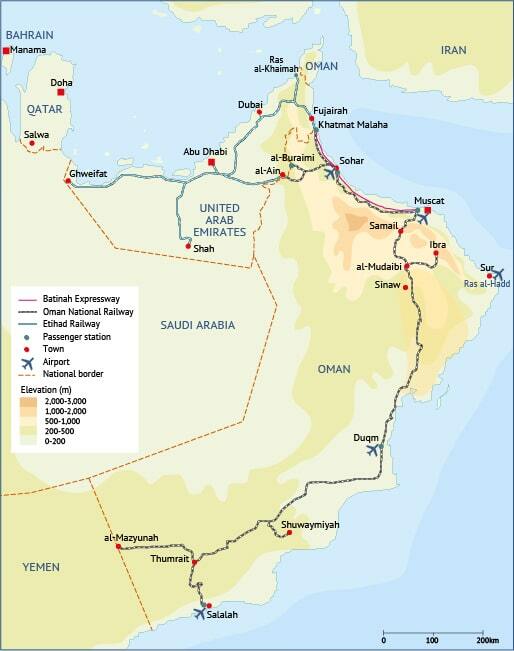 The Omani government decided to extend the railway towards the south, eventually connecting southern Oman with the Etihad Rail network in the United Arab Emirates and further afield. 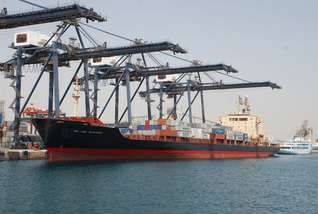 This is expected to serve Oman’s ports on the Arabian Sea coast and maximize their potential. In this way, the sultanate is trying to bring international shipping companies to its shores, taking advantage of rail transport, instead of facing delays at crowded ports in the Gulf. In addition, Oman would offer an alternative route for freight transport in case regional tensions should disrupt shipping through the strategic Strait of Hormuz (through which about one-third of the world’s oil supply is currently shipped). The diesel-powered rail line will also feature passenger services, improve access to remote areas, and boost economic activity in the regions beyond the capital. Yet, given the fact that the car remains the preferred mode of personal transport in the Gulf, it remains to be seen whether many Omanis will use the train. Construction on the 2,244-kilometre long railway, costing an estimated 15 billion USD, is planned to begin in early 2015. Design, planning, and construction will be carried out by consortia of international companies, but the Omani government is seeking to maximize local staffing and manufacturing capabilities, according to MEED. As with the construction of roads in the sultanate, the double-track railway will pose an enormous engineering challenge due to Oman’s mountainous and rocky terrain, requiring many bridges, tunnels, and underpasses. The network is planned to be operational by 2018 or 2019, but MEED characterizes this as ‘overly ambitious’, given the current rate of the procurement progress. According to Construction Week Online, Oman’s logistics market is set to grow by 50 percent, to 12 billion USD, by 2017. This would mean a positive outlook for Oman’s growing role in logistics, and consequently, for the country’s economic diversification. Another cornerstone of investment is the construction of new roads and the upgrading of existing ones. In its five-year economic plan (2010-2015), Oman has allotted 3.2 billion USD for road construction, with this infrastructure category ranking second highest, after airports. This indicates the importance the government has attached to improving Oman’s road network. Areas that used to be remote and inaccessible have already been connected with Muscat and other towns in recent years, through new roads and dual carriageways. Contractors have succeeded in overcoming the country’s diverse geographical conditions, which pose an engineering challenge. 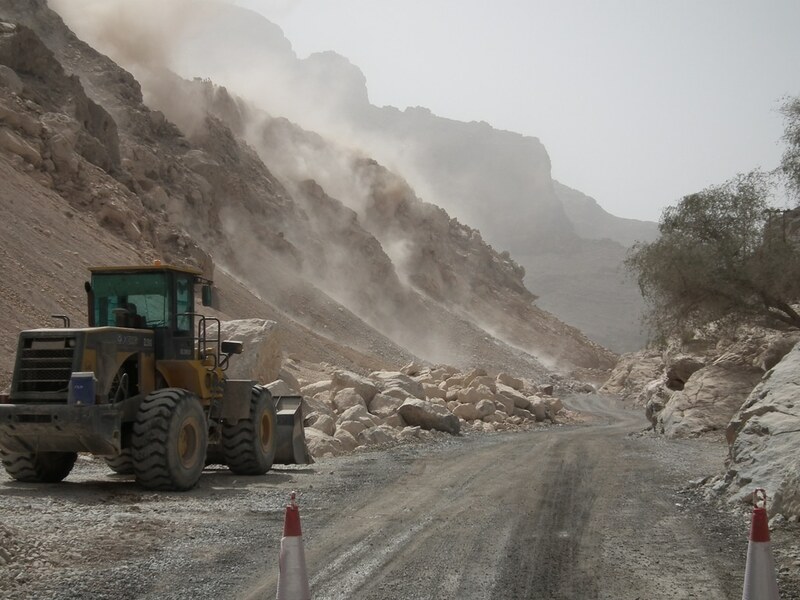 Whole mountains have been blown up to make way for roads, or motorways have been constructed right across intervening mountains, as is seen in the case of the dual carriageway connecting Muscat with the suburb of al-Amarat. A better land connection to the UAE has been planned, with the construction of the Batinah Expressway, connecting Muscat with the UAE border and the port of Sohar (at a cost of approximately 2.59 billion USD, according to MEED). The Batinah Expressway, the largest of all Oman’s road projects, will primarily support the port of Sohar, which has grown significantly in recent years. As the first four-lane motorway in the country, the road will further open up Sohar to markets in the United Arab Emirates. 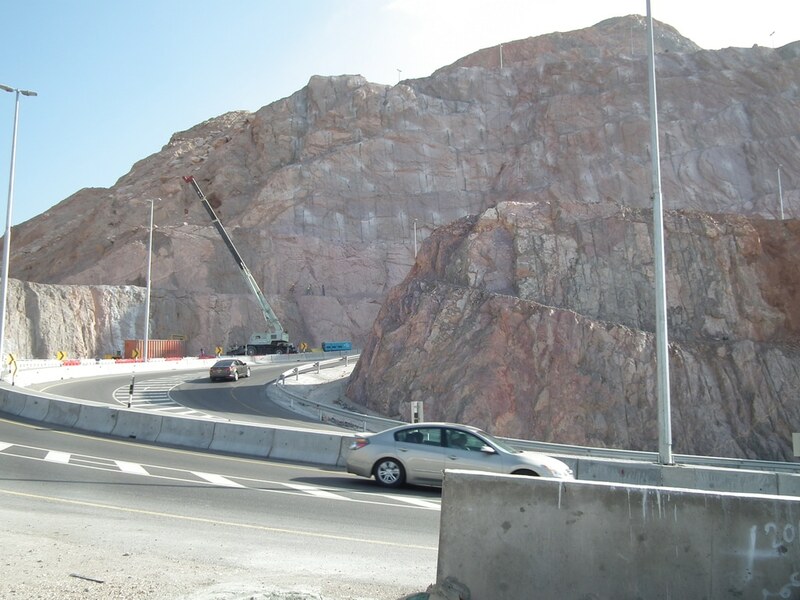 Another major project is a new dual carriageway planned to improve access to the Musandam peninsula, running through mountainous terrain and including seven tunnels and 18 bridges, at an estimated cost of 1 billion USD. Oman is spending billions of dollars to improve its airport infrastructure as part of an effort to boost its economy, and the tourism sector in particular. Muscat International Airport, which handled 6.8 million international passengers in 2012, is currently being expanded. A new passenger terminal, runway, and control tower are planned to open in late 2014 and are set to increase the airport’s passenger capacity to 12 million by 2014. Future extension phases are planned to expand capacity to 48 million passengers (which is still far less than Dubai International Airport, for example, which handled more than 66 million passengers in 2013). Salalah airport, in the governorate of Dhofar, is also being expanded and will see its capacity grow to one million passengers a year. In addition, regional airports are planned for Sohar and Duqm (under construction) and Ras al-Hadd and (supporting the tourism sector). While the outlook looks promising, Oman faces the huge challenge (apart from its challenging terrain) of securing the resources and skills needed to execute these projects, while so many other major projects are under way in Oman and elsewhere in the Gulf. Oman has great potential when it comes to tourism. With long coastlines, dramatic mountain scenery and many historic sites, including four UNESCO heritage sites, the tourism sector is a focal point of diversification. The Ministry of Tourism aims to attract 12 million visitors by the year 2020. Oman received 1.36 million tourists in 2007 (Ministry of Tourism 2011); the figure further increased to 1.96 million visitors in 2013 (NCSI 2014). According to the World Travel & Tourism Council, the direct contribution of tourism to Oman’s GDP amounts to 3.3 percent of Oman’s GDP (2014) and with 37,000 jobs generated, it accounts for 3.5 percent of total employment (2014). With these results, Oman is ahead of Saudi Arabia, Kuwait and Qatar, but behind the UAE and Bahrain. According to MEED, the reality of the tourism sector does not always match up to Oman’s potential. Omani nationals spend more on foreign trips than the income Oman receives from international visitors. The tourism trade gap was around 380 million USD in 2011 (MEED). MEED cites the lack of infrastructure and investment. However, the government has been investing heavily in the sector. One of the main projects now underway is the major upgrade and expansion of Muscat International Airport. The new terminal building that is being built will have a capacity to handle 12 million passengers a year. An additional runway is being constructed, while the existing runway will be upgraded to handle the super-sized Airbus A380. In the south, Salalah International Airport is planned to expand to a capacity of 1 million passengers a year. Smaller airports are planned in Sohar, Duqm, Adam and Ras al-Hadd. Several large tourism projects are also underway (most will be completed within the next five years). These include ten resort-style developments under construction in various parts of the country plus a mega 6000-seat Convention Centre on a site close to Muscat International Airport. The Sultan Qaboos Port in Muttrah, traditionally designed to handle cargo, will be transformed into a port dedicated to tourism and catering for cruise ships. 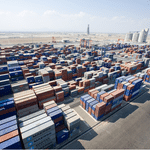 All cargo trade will be moved to the port of Sohar. Although difficult to assess, the significance of the informal sector seems relatively limited. Handicrafts and traditional industries, produced by women, and trading networks are considerable. Production and trading by migrants largely from Pakistan and India, is another segment of the economy insufficiently documented statistically. Most of the expatriates employed in the commercial sector run retail businesses, as well as farms, more or less independently. Little is known about the actual size and turnover of these businesses. Traditional subsistence activities are pastoralism (camels, goats, and sheep), agriculture (dates and other fruits and vegetables), fisheries, and trading and crafts. Over 66 percent of Oman’s population is involved in herding and agriculture. The estimated area of irrigated, cultivable land is 2.2 million hectare or 7 percent of the total area. Agricultural holdings account for 5.7 percent of cultivable land. 46,075 hectare is currently under permanent crop cultivation(Source: FAO), producing around 1,57 million tons of crops (2010, Source: Ministry of Agriculture and Fisheries). These are destined for local markets and export. Irrigation channels, partly subterranean, and pumped water provide for the necessary irrigation. The development of agricultural activities is hampered by difficult conditions, such as limited water resources. The sector is also characterized by smallholdings (on average one and a half hectare) and fragmented ownership. Many owners are absentee and work elsewhere for a higher income, leaving the labour to migrant workers. These conditions prevent development into a self-sustaining sector which produces sufficient food or income for locals. As a result, the agricultural sector receives financial, technical and educational incentives. A sustained development of agriculture and herding is a prerequisite for continued life in the desert and oasis settlements. There are experiments with organic farming. Most of the crafts are also based on agricultural resources, in particular from date palm trees, such as leaves, fronds, bark, branches and fibre. Local clay is used for pottery. Incense, herbs and other fragrant materials are used for the production of incense (bukhur), which is made and/or available in every household. Fisheries form a relatively important income-generating sector. Some 15,000 fishermen are involved in this sector, which provides a source of living to about 100,000 people. Fisheries play a dominant role in the economy of the coastal regions, which occupy a 2,092 kilometre coastline. Most of the fish is caught through traditional fisheries (133,000 tons out of 148,000 tons in 2007) In 2011, production was 158,723 tons (Source: FAO). Although an estimated 4.3 million tons are available for fishing, studies indicate that harvesting should not exceed 175,000 tons annually in order to sustain future catch. The Marine Science Centre located in Muscat conducts this type of research in fisheries. Industrial fisheries are located in the area around the capital. 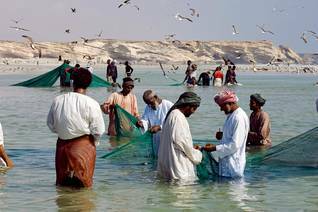 Already at an early stage, the government promoted agriculture and fisheries to reduce Oman’s reliance on food imports. Nevertheless, despite the investments and the apt response of the private sector, their relative contribution to the economy has declined with the expanding oil industry. In the last Five-Year Plan further development of fisheries was pursued through supporting modernization of the fleet and upgrading of infrastructure related to export. Trade is now the motor of the economy and its diversification. Re-export is the focal point. 60 percent of the goods arrive by sea. Thus trade has regained its traditional significance. Maritime activities used to supply the Omani population with a supplementary source of income. Oman’s location on the south-eastern corner of the Arabian Peninsula, bordering the Gulf and the Arabian Sea, enabled its people to participate in long-distance trade networks. 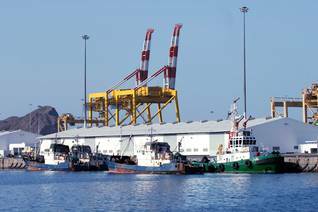 Its ports, located favourably as regards the monsoon winds and strategically placed between the African and Asian continents, functioned as warehouses. 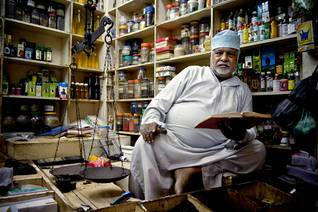 In addition, Omani products such as incense and dates used to find their way to the intercontinental markets. At present, oil, gas and a growing number of other commodities have taken their place. 3 percent of Oman’s GDP (World Travel & Tourism Council 2013). 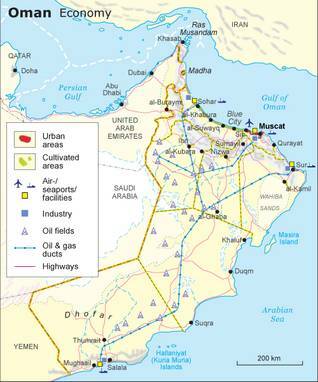 Oman’s economy is classed as an upper middle-income economy based on hydrocarbons. Oil was first exported in 1967. Since then the economy has rapidly expanded, relinquishing its traditional activities of agriculture and fisheries. As it is estimated that oil resources will run out by the middle of this century, diversification of the economy is being pursued, with a focus on trade, manufacturing, tourism and information technology. Expansion is supported by government investments in infrastructure, education, and fiscal incentives. 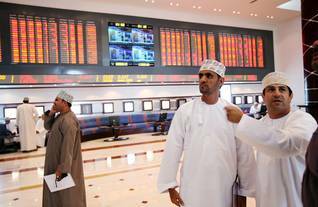 Participation of Omanis in the economy is a serious concern and has been actively promoted since the 1990s. Oil and gas together provide for 75 percent of the country’s export earnings. Gas represents a quarter of hydrocarbon revenues. 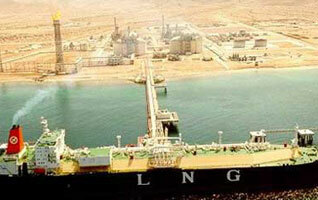 Petroleum activities (crude petroleum and natural gas) account for 45 percent of Oman’s GDP. Non-petroleum activities are dominated by the services sector (38.5 percent). The manufacturing industry accounts for 16.6 percent and agriculture and fisheries for 1.3 percent. High oil prices have contributed to Oman’s economic growth (GDP’s growth rate was 7 percent in the 6th Five-Year Planning period from 2000-2006). In 2007, the average oil price was set at 65.15 USD per barrel. In the industrial sector in particular, oil or gas related industries such as gas liquefaction, petrochemicals or aluminium production have increased GDP. Non-oil pillars are transport and communications with a growth of 25.4 percent in 2006, wholesale and retail trade and other services (health and education). The value of total exports, including re-exports, increased with 15.5 percent in 2006. 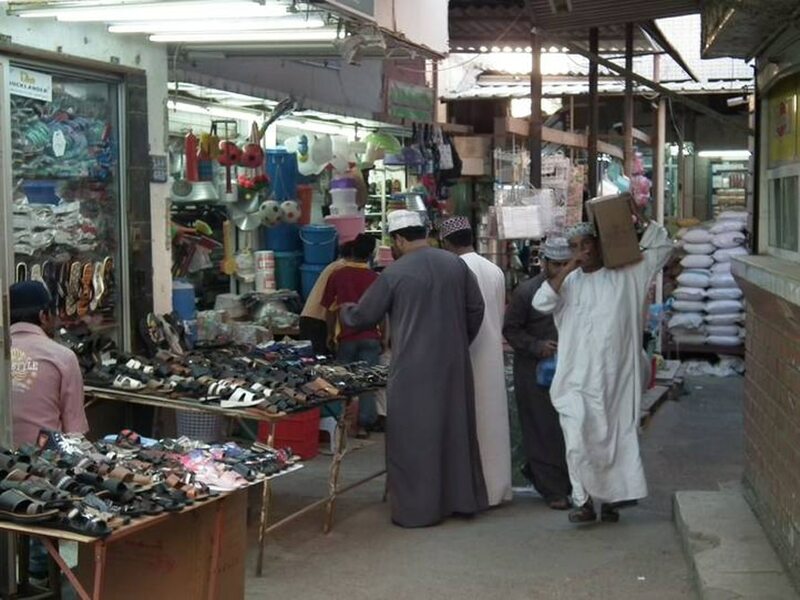 Oman’s economy is however vulnerable. Revenues will decline if the oil prices drop or oil production decreases, whereas expenditures will remain the same or increase. In this situation planning is particularly important. Since 1976, Oman has drawn on a series of five-year plans, which set objectives for all government sectors. The 7th Five-Year Plan ran from 2006 to 2010. In 1995, in view of the depletion of oil, the government formulated a vision of the economy for the year 2020. The document Vision 2020 constitutes the macroeconomic framework on which the country bases its national development plans. Oil dollars offer Oman a relative independence from international financial institutions. Oman does not borrow from the International Monetary Fund or the World Bank. On the other hand, because of its relatively high-income status, Oman is not ranked as a developing country, although in many respects it is in a developmental phase. Oman is paving the way forward for sustained development beyond the finite oil-based economy. Diversification aims at widening the economic base and securing jobs for its population. It has been an objective in subsequent five-year programmes. The sectors aimed at are the manufacturing industries, tourism and trade. Traditional sectors such as agriculture and fisheries also receive investments and other incentives. Manufacturing is a focal point in the diversification strategy. The current Plan aims at enhancing the growth of non-oil sectors at an annual rate of 7.8 percent on average. The gas based industries, the tourism sector and non-oil merchandise exports of Omani origin are set to realize an annual growth rate of 10 percent or more. The industrial sector is to contribute some 15 percent to the country’s GDP by 2020. 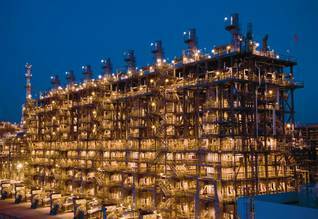 Billions of dollars are being invested in gas-based industries such as Sohar Aluminium Smelter and the Polyethylene and Oman Aromatics projects. Capital intensive industries such as Oman Oil Refinery and Oman LNG receive large investments, even though these industries offer restricted employment opportunities. However, diversification is proving difficult to realize for a number of reasons. The oil industry is basically an enclave activity with few backward and forward linkages to other manufacturing industries. This was especially so when crude oil was predominantly exported from Oman. This trend has reversed with the development of the petrochemical industries. The oil sector tends to draw capital and labour from lagging sectors such as other manufacturing industries, agriculture and fisheries, although the oil price volatility makes planning difficult. The government sees an important role for the private sector, which traditionally plays a keen role in economic development, to attain the above-mentioned goals. According to Vision 2020, the private sector is effective, self-reliant, and competitive, the main vehicle for national income generation, and the moving force behind job creation, assuming its social and environmental responsibility. Electricity, water, and other commodities are being privatized. Proclaiming a capitalist approach yet recognizing the fragility of the economy, Oman seeks to benefit from the protective provisions laid down in the World Trade Organization agreements. Oman has a policy of spreading development evenly throughout the country. However, with the dominance of the capital area, other regions tend to lag behind. In its 4th Five-Year Plan (1991-1995), the government allocated 60 percent of development expenditures to balance regional disparities and to prevent depopulation of the countryside. It upgraded the regional infrastructure, services and finance, in combination with development of various sectors. Seven industrial estates have been established throughout the country. 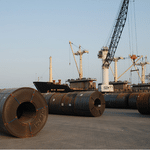 Dhofar received investments for a bulk harbour in combination with industries. Oman NLG was established in al-Sharqiya. 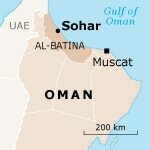 The most recent and largest estate is Port Sohar in al-Batina, where most of the country’s heavy and petrochemical industries will be located. This huge project, with investments approaching 14 billion USD, is a fifty-fifty partnership between Oman’s government and the Port of Rotterdam, The Netherlands. In the Wusta region a smaller fishing port and docking area are planned. These and other development projects are meant to become regional growth poles, inducing other economic activities and securing employment. The exploitation of oil in the Arabian Peninsula, which began in the 1920s but increased considerably after World War II, induced a national and international movement of labour in the Middle East. In the early 1980s, more than 5 million people were involved, by the early 21st century, this number had almost doubled. Quantitative and qualitative demand far outstripped the national labour supply in oil-endowed states. Initially characterized by an inter-Arab exchange of labour, the labour force soon turned international, being dominated by Asian immigrants from the Indian subcontinent. They were keen to participate in the economic boom relatively close to home in exchange for lucrative salaries (wages for unskilled labourers from Bangladesh in the early 1980s, were five to six times higher in the Gulf countries than at home). The gradual shift from construction to services increased the proportion of labour from Far East Asian countries such as Korea, Taiwan, the Philippines and Thailand. At first, no restrictions applied to labour immigrants, apart from the sponsor system. However, with the onset of ‘Omanization‘, a more restricted approach was introduced. Nowadays, all expatriates coming to Oman need a work permit supplied by a national company, which is issued on a yearly basis. The sponsor is responsible for the payment and the physical well-being of the sponsored person. If a problem arises both migrant and sponsor have the right to obtain judicial advice from authorities or plea a court case. Restrictive regulations concern the number of foreign workers permitted per company. Certain sectors have become closed for non-nationals, such as the taxi business and public transportation. This policy has been expanded to various sectors, with varying success. For example, the ban on foreign hairdressers was soon lifted when it became apparent that few Omanis were willing to enter this sector. Foreign ownership of companies is limited to a maximum of 49 percent. Oman established a Labour Law in 1973, which regulates amongst other things industrial relations and employee affairs, employment contracts, work descriptions, and working hours. In 1991, the Social Insurance Law was enacted. Companies with more than 50 employees need to establish representative bodies for trilateral representation. The labour inspection at the Ministry of Labour monitors adherence to the rules. It settles disputes and observes the grievance procedure. The Ministry of Manpower received 297 grievances from labourers in 2008. New royal decrees in 2003 and 2006 brought the Labour Laws into further accordance with international labour standards. Improvements included procedures for union activity, collective bargaining, and strikes. A Court of Justice caters for government employees’ grievances. In 2003, in letters to the six states of the Gulf Cooperation Council, Human Rights Watch strongly urged their leaders to endorse the International Convention on the Protection of the Rights of All Migrant Workers and Members of Their Families. 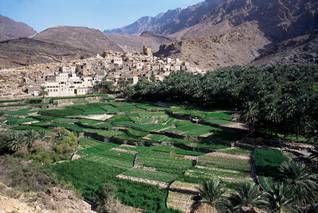 Environmental issues in Oman concern the delicate balance between water resources, agricultural needs and economic development through industrialization and population pressure. For example, modern farming and irrigation practices lead to salinization of the soil, intrusion of seawater into wells and overexploitation of land. Marine and coastal area pollution and erosion of coastal ecosystems are also due to property development, construction of recharge dams, increased tourism and population pressure. Tourism and the protection of the environment sometimes serve opposing interests. However, Oman is beginning to acknowledge the nexus between economic growth and environmental conservation on the one hand, and human development and the ability to sustain it well into the future on the other. A series of royal decrees on these issues and on the protection of nature reserves and wild life are to ensure maximum protection. Since 2008, the Ministry of Environment and Climate Affairs (MECA) is responsible for the environment and sustainable development. The ministry proclaims a policy of conservation of renewable natural resources, marine environment and fish resources, grazing lands, forests, and wildlife. Projects include the development of 18 recharge dams, 35 storage dams, census of wells and of the traditional irrigation system (falaj) to make better use of water resources. Marine environment and fisheries projects concern fishing research, improvement of statistics and mangrove planting. Agricultural environment conservation projects are improving irrigation techniques and proclamation of natural reserves. Sustainable development indicators monitor the process.